You Can Teach Grammar is an outstanding companion book for every new ESL teacher. Its clear grammar explanations will provide every teacher with solid background knowledge in all the key grammar concepts. These grammar fundamentals are paired with excellent activities, communicative teaching ideas, and methodology suggestions. 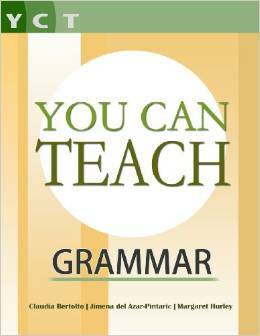 These teaching aids will enable teachers to boost the effectiveness of their grammar lessons. Get it now for $39.99! Answer Difficult Grammar Questions and Plan Fun Grammar Lessons! Each chapter explains a major grammar concept in a detailed, down-to-earth manner, enabling teachers to plan their lessons with confidence and clarity. Furthermore, the lesson ideas are diverse in approach, and offer variations for different levels of English. You Can Teach Grammar covers each of the parts of speech in detail. In addition, the book addresses areas of persistent difficulty for students: sentence structure, comparatives, verb forms (tenses, gerunds, infinitives) and determiners (including the devilish definite and indefinite articles). The topics are covered in four ways. First, the deep grammatical concepts are laid out, allowing teachers to clarify the nuances of each grammatical element. Second, the book includes self-practice quizzes, allowing teachers to verify their own comprehension of the topic. Third, any particularly “sticky” problems that are prone to occur in the classroom are addressed. Finally, teaching ideas for each grammar element are given. Perfect For New ESL Teachers! This is a must-have book for every ESL teacher. Beginning teachers will find that it will bolster the confidence and strength they need to help their students achieve their goals. Experienced teachers will find in it refreshing ideas for lessons and activities with a solid grammatical explanation to take their lessons and their students to the next level.